The other day, I got a message through Etsy from a lady named Rory who was seeking donations for a silent auction to benefit a ministry her daughter started. It’s called Project Yesu and its all about providing food, medicine, and education for children in Uganda. And the founder, Mallory? She’s twelve. That’s right. Twelve years old. And God has used her to start a ministry. All because she has a heart for helping children on the other side of the world. It all began when her mom asked her to write down her Christmas list. After reflecting on it, Mallory realized she had everything she could possibly need. So, the only thing she put on her list was Help Africa. And Project Yesu was born. I could tell you more, but I think you’ll enjoy hearing it from Mallory herself…here’s a little Q&A I had with this special young lady. I am 12 years old (just turned 12 on 3/3) I like spending time with my friends, I like working with kids, I volunteer at my church in our pre-school ministry. I like to read and to write and listen to music. Why are you especially interested in helping kids in Uganda? When I met the children from the Ugandan Orphan Children’s choir, they were so loving and so full of joy, I just loved them. Even though the children and the people of Uganda have so little they have so much joy and that is something that we can learn. How is the daily life of a child in Uganda different from a child here in America? It’s a lot different, like my sponsored children in Uganda they like to wash dishes, and to fetch water. Here kids would think that is a punishment. A lot of children in Uganda don’t have a mom or a dad or both. HIV/AIDS has made a lot of kids orphans. Many children don’t have food, and they can’t afford to go to school, they want to go to school, here kids beg not to go. I hear you’re going to be taking a trip to Uganda soon; what will you be doing there? When we go to Uganda we will visit Amazima, Project Have Hope and Ekisa the three organizations that I help there. I will get to go to Amazima’s feeding program where they feed over 400 children in Masese which are the poorest in the area. And the best part is that I will be able to meet the two boys that we will be adopting for the first time, my brothers! What is the hardest part about organizing and running Project Yesu? The hardest part is when I have to stand up and talk in front of people. I get so nervous that I feel like I’m going to throw up. The best part is getting letters and pictures of my sponsored children. What is your current goal? Long term goals? My goal for this year is to raise at least $4,500 – I need $2000 to travel to Uganda, $500 for Ekisa, and $2,000 to continue sponsoring my seven children. My long term goal is to be able to continue sponsoring my 7 children, but also to raise more money to help more children. What can readers to do help you reach those goals? The best way to help me is to spread the word, the more people who know about Project Yesu the more money we can raise and the more lives we can change. They can make a donation, or buy a tshirt or bracelet from our store. Thanks so much, Mallory, for telling us more about your cause. Readers, does hearing Mallory’s story do to you what it does to me? It makes me ashamed of the way I take for granted the material blessings in my life. It convicts me about my constant desire for more “stuff.” It reminds me of the importance Jesus placed on giving to the poor. And it humbles me when I think about how many times I’ve ignored God’s call because I felt too young, too small, or too insignificant to make a difference. So here’s what this humbled Artsy Mama is going to do. 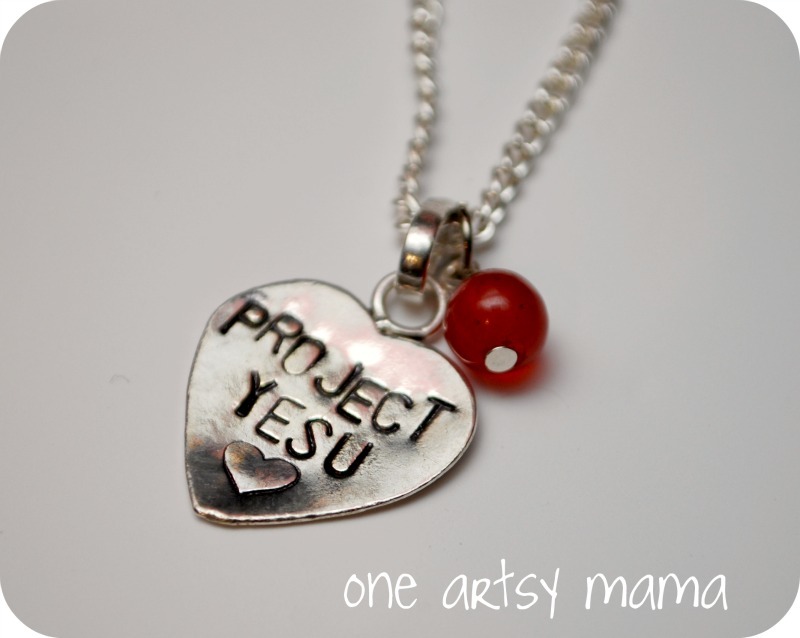 We’re going to be adding a special handstamped necklace to the Project Yesu shop. These necklaces will sell for $18, $10 of which goes directly to support Project Yesu’s ministry and make a difference in the lives of children in Uganda. Thank you, Mallory, for responding to God’s call and for selflessly putting the needs of others above your own desires. You are an inspiration. PS: If you’d like to learn more about Project Yesu, you can connect with Mallory on Facebook, follow on Twitter, and visit her impressive website! well, i don’t even know how i came across your blog this morning but i am so thankful that i did. i have printed this blog post to share with my 7yo daughter, who also has a heart for children in lack. i want her to read Mallory’s story and be encouraged that she, too, can make a difference! i love that Mallory set goals and is working hard to accomplish them…all for the glory of God! thank you for sharing this amazing story and for doing your part to help, too! Wow! This has me tearing up as I read it. What a precious young lady with a heart for others! God is definitely humbling me and I am so thankful that there are young people out there with a heart for Him, for missions, and for reaching others in need! Thank you for sharing this story, Amy! I am going to visit her site and spread the word! This is truly amazing – God is certainly so good! I LOVE that this young lady has a heart for giving and helping others – it all starts with charity … very humbling and inspiring story! I’m going to share this with my children, on FB and visit her site! Thanks so much for sharing! Amazing! I got goose bumps reading this. What an inspiration and an excellent testimony for what God can do with a life that is open to His leading!